This coming Saturday I'll be at the local Chatham Highland Games and Alan McKenzie is attending with his NEW Clan Tent which I look forward to seeing. I'm going to try a new system for covering the Clan Tents just to see how it works out. I thought I'd try doing a video interview with each tent and the people that organise them. Should it work out I'm then intending to go to the Fergus Highland Games in August and try the same thing with them. Mind you Fergus does have around 50 clan tents so not sure how long that might take. I've emailed around 7 people in Glasgow Council from the Provost through to media and PR department and even the councillor responsible for external links but not a single reply. I'd hoped that they might send us in some information on modern Glasgow as we went through the history. I don't know what it is about marketing people as they never seem to respond to these sorts of enquries and it's not just Scotland at fault but folk in Canada, USA, etc. I can't help thinking that where we feature a book on an area on the site then folk reading it would also be interested in learning more about the area of today. This then gives them an opportunity to promote their area to todays potential visitors. "Dictionary of the Gaelic Language", "How to Learn Gaelic" and "The Illustrated Gaelic Dictionary" in 3 volumes, specially designed for Beginners and for use in Schools. All these pdf files are quite large but I figured if anyone was serious in learning or studying Gaelic then downloading these books would be worthwhile to have on your own computer. I am still trying to get audio or video recordings of Gaelic so will try to develop this new section. Heraldry is an International matter and thus we'll be covering this from an International perspective. We have added two pdf books to kick off the section, "The Law and Practice of Heraldry in Scotland" and "A Complete Guide to Heraldry". We have also added an article, 28th International Congress on Genealogical and Heraldic Sciences, Quebec City – June 23-27, 2008. By: W. Neil Fraser with photos by Marie Fraser. You'll also find links to the premier heraldry web sites. Our thanks also to Neil and Marie Fraser for helping us get this new section started and we hope to get a number of articles to expand this section. Have started a new book "Scottish Gardens" for which more below. Douglas Stewart, and his master's research focuses on perceptions held towards automobiles and their country of origin---reputation, prejudices, perceptions, etc. The Electric Scotland Aois Community is a social networking site and we'll be working on adding extra functionality to this in the coming months. Today I just happened to look at the Picture albums and only saw my own so was wondering if anyone else had added a picture album? And if no-one has added one perhaps someone could add one to see if the system works? I might add that when you do create a picture album you can add more than 1 and you can make them public or private. I would guess you'd need to make at least 1 public to see if I can view it. You add a picture album under the "User CP" link which is short for "User Control Panel". When you click on that you see an entry in the left panel for "Pictures and Albums". To view picture albums I went to "Quick Links" and selected "Pictures & Albums". The Community is at http://www.scotchat.org/vbull and you do need to be logged in to add pictures. I might add that Guests can come in and view the system but can't add any messages or pictures to the community. Have added a bit at the foot of this newsletter "Seeking Information" in which hopefully you can help two individuals with their enquiries. In common with many Border towns, the Royal burgh of Annan enjoys an annual Riding of the Marches when a cavalcade of horse perform an inspection of the town’s boundaries. There was extra joy in the town’s celebration last Saturday as Annan had featured widely in the Scottish media – all thanks to Scotland’s favourite sport, Football. On Thursday 3 July 2008, the local East of Scotland side Annan Athletic , founded in 1942 as part of the Dumfries and District Welfare League, took a major step forward with entry to the Scottish Football League. “Where is Galabank?” will be the question on the lips of many football fans, especially those in the current Scottish Third Division. The answer is simple as Galabank, the 3,500 capacity home of Annan Athletic and its successful social club, lies a short 15 minute walk from Annan Railway Station. En route you will pass the town’s museum, well worth a visit, the excellent chip shop, Café Royal, on the site of the building where Robert Burns wrote ‘The Deil’s Awa Wi The Exciseman’, and the Blue Bell Inn, where a splendid pint of Real ale can be enjoyed. The demise of nearby neighbours Gretna FC , following a roller-coaster funded by English businessman Miles Brookson, led to the SFL having to fill a vacancy in the Third Division. After three rounds of voting, Annan Athletic beat off the challenge of three fellow East of Scotland sides – Spartans, Edinburgh City and Preston Athletic – and Highland League champions Cove Rangers to gain a foothold in Scottish senior football. Ahead in every round, Annan in the final vote gained 17 votes to Cove’s 12. Annan will kick-off life as a SFL side away to Clyde in the Challenge Cup on Saturday 26 July 2008 at 3pm, and Galabank will host its first-ever home Third Division league game on Saturday 9 August 2008 when Stenhousemuir, The Warriors’, will be the visitors. 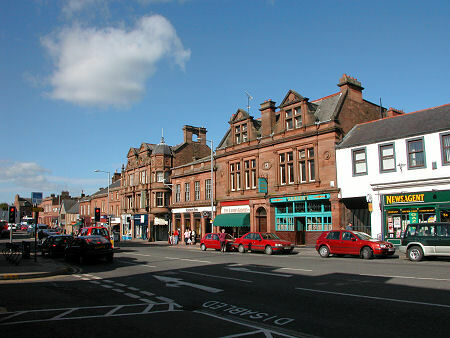 Annan is the third largest town in Dumfries and Galloway, with a population of some 10,000, and now join the largest town Dumfries and second largest Stranraer in Scottish senior football. This well-run club makes an interesting addition to the towns on the SFL circuit. Apart from football Annan is well worth a visit. A Royal Burgh standing near the mouth of the River Annan where it enters The Solway, since at least the days of James V, King of Scots, has much to offer any visitor. Famous folk from Annan include the noted preacher Edward Irving, a statue to him stands in the old churchyard, and the blind poet Thomas Blacklock, whose friendship and approval helped dissuade Robert Burns from emigration. Any visit to the Borders is not complete without a slice of Scottish Border Tart along with a fly cup. Method: Pre-heat oven to 190°C: 375°F: Gas 5. Lightly grease a 7 inch round baking tin. Roll out the pastry on a floured surface and line the baking tin. Gently melt the butter and sugar together in a saucepan. Remove from the heat and allow to cool. Add the dried fruit, walnuts and cherries. Stir in the beaten egg. Place the mixture into the prepared baking dish. Bake for 25 to 30 min or until the pastry is slightly browned. Allow to cool. Mix the icing sugar and lemon juice together. Spread over the top of the tart, allow to set before serving. We are onto the R's now with Ritchie, Robert, Robertson, Robison, Rocheid, Rodger, Rollo and Rollock. ROBERTSON, the name of a Highland clan, called in Gaelic the clan Donachie, of which Robertson of Strowan in Perthshire is the chief. Tradition claims for the clan Donachie a descent from the great sept of the Macdonalds, their remote ancestor being said to have been Duncan the Fat, son of Angus Mor, lord of the Isles, in the reign of William the Lion. Skene, however, in his History of the Highlanders, traces them from Duncan, king of Scotland, eldest son of Malcolm III., their immediate ancestor being Conan, second son of Henry, fourth and last of the ancient Celtic earls of Atholl. This Conan, in the reign of Alexander II., received from his father the lands of Glenerochy, afterwards called Strowan, in Gaelic Struthan, that is, steamy. His son, Ewen, had several sons, one of whom was the progenitor of the family of Skene (see SKENE, surname of). Ewen’s grandson, Andrew, was styled of Atholl, de Atholia, which was the uniform designation of the family, indicative of their descent from the ancient earls of Atholl. Andrew’s son, Duncan, gave the clan their distinctive appellation of the clan Donachie, or the children of Duncan. He married, 1st, a daughter of a certain Callum Rua, or Malcolm the red-haired, who, being styled Leamnach, is supposed to have been connected with the earls of Lennox, and by his wife he acquired a considerable accession of territory, including the southern division of the glen or district of Rannoch. The clan Donachie were adherents of Bruce, and on one of the two islands in Loch Rannoch a Macdougal of Lorn, taken prisoner in one of their clan battles, was confined for some time, but contrived to make his escape. By his first wife he had a son, Robert de Atholia. Duncan married, 2dly, the co-heiress of Ewen de Insulis, thane of Glentilt, and got the east half thereby. By her he had, 1. Patrick de Atholia, first of Lude. 2. Thomas de Atholia of Strowan. 3. Gibbon, who had no legitimate issue. The old parish of Essie was, very long ago, united to that of Rhynie. The parish is bounded on the north by Gartly; on the south, by Auchindoir; on the west, by. Cabrach. Its figure is nearly square. The soil is various. There is but one mountain in the parish : it is called Noth, about 1000 feet above the level of the sea. This parish is bounded on the north, by the parish of Keith; on the south, by Glass and Huntly; and on the east, by Huntly. ARCHIBALD MACDONALD was perhaps the most perfect master of his hazardous profession of any who ever practised it. Archibald was by birth a gentleman, and proprietor of a small estate in Argyllshire, which he however lost early in life. He soon distinguished himself as a cattle-lifter on an extensive scale; and weak as the arm of the law might then have been, he found it advisable to remove further from its influence, and he shifted his residence from his native district of Appin to the remote peninsula of Ardnamurchan, which was admirably adapted to his purpose, from its geographical position. He obtained a lease of an extensive farm, and he fitted up a large cowhouse, though his whole visible live-stock consisted of one filly. His neighbours could not help making remarks on this subject, but he begged of them to have no anxiety on that head, assuring them that his byre would be full ere Christmas; and he was as good as his word. He had trained the filly to suit his purpose, and it was a practice of his to tie other horses to her tail; she then directed her course homeward by unfrequented routes, and always found her way in safety. His expeditions were generally carried on by sea, and he annoyed the most distant of the Hebrides, both to the south and north. He often changed the colour of his boats and sails, and adopted whatever appeared best suited to his immediate purpose. In consequence of this artifice, his depredations were frequently ascribed to others, and sometimes to men of the first distinction in that country, so dexterously did he imitate their birlings and their insignia. He held his land from Campbell of Lochnell, into whose favour he had insinuated himself by his knowledge and address. This week added pages about Catarrh, Catchfly, Catering, Catterpillar, Cathartic, Catheter, Cathode, Cattleya, Caul, Cauldron, Cauliflower, Caustic, Caustic Soda, Caviare, Cayenne, Ceanothus, Cedar, Ceilings, Celeriac, Celery. I might add that articles like Celery and Cauliflower show you how to grow it and cook it. BEFORE we begin to chronicle the great feats of Young Tommy, who for a time alas! it was for too short a time quite overshadowed even his father's great reputation as a golfer, let us consider what Tom Morris was in his prime as one of the greatest players of his day. Let his friend, Mr H. S. C. Everard, introduce him. "Turn we now to his golfing capabilities," says that excellent player and equally excellent writer in the Badminton Golf (Longmans). "As to that, there is no doubt he was, when in his prime, a very fine player, though perhaps there has been a tendency in some quarters to with-hold from him that recognition of his merit which is undoubtedly his due, and to make use of such a phrase as 'respectable mediocrity' when referring to him; and, indeed, as one writer has well remarked, we really are perhaps apt to forget how good a player he was owing to the fact of his fame in a great measure being over-shadowed by that of his son, Young Tom, with whom he freely admits he never could cope. Then, too, the standard of play has reached a height never approached in Tom's younger days: so many men, professionals and amateurs alike, are so very good that his best performances are equalled and excelled every day; this, too, tends to the belittling of his deeds of fame. "But," Mr Everard goes on to say, "it is to be borne in mind that four Open Championships have fallen to Tom's share, viz., in 1861, 1862, 1864, and 1867, with scores of 163, 163, 160 and 170 respectively, over Prestwick, and that he was at least the equal of any man living for a great number of years." Then Mr Everard comes to what, amongst the greatest living players, has been his besetting sin, judged from the standard of perfection. "True it is that but for one peculiarity he would have been better still; one weak place there has been in his armour, and not a golfer but will know to what we refer. Those short putts! Put him 12 feet from the hole and not a better holer-out could be named. But with 18 inches or 2 feet as the measure to be negotiated but it were kinder to allow the figure of aposiopesis to come to the rescue. Candour, however, compels the admission that of late years he has evinced (the first edition of the Badminton Golf was issued in March 1890) an enormous improvement in this latter respect. In his own words, 'I never miss thae noo! but it is improbable that he will ever live down his shady reputation regarding them; and if he were to hole 5000 consecutively, but miss the five thousand and first, it is a moral certainty that the taunts of the scoffers would be levelled at him as of yore. One day, many years ago, he had a most successful encounter with a putt of some six or seven inches, not with his putter, which he habitually used, but with his iron, and for many a long day afterwards, being convinced that he was now at last happy in the possession of the magic secret, he toiled on valiantly with this weapon with varying, but, on the whole, tolerable success. His one theory is (and few golfers will be prepared to question it) that whatever the club used, 'the ball maun be hit,' but the trouble is, or rather was, with him, that he couldn't hit it. 'Gin the hole was a yaird nearer him, my fawther wad be a guid putter,' Young Tom used to say of him, with a touch of unfilial satire; and Mr Wolfe Murray once went so far as to address a letter to 'The Misser of Short Putts, Prestwick,' which the postman took straight to the champion." History of the Scotch Linen Trade—Curious Acts of Parliament relating to the Making and Use of Linen—The Board of Trustees for Manufactures and their connection with the Trade—The British Linen Company —Domestic Character of the Linen Manufacture in its Early Days— Vicissitudes of the Trade in the Rural Districts—Rise and Progress of the Linen Trade in Forfarshire, Fifeshire, and Perthshire—Dumfermline: its early connection with the Linen Trade, and present celebrity for the Manufacture of Table Linen—Early Days of the Linen Trade in Dundee—Introduction of Jute, and its Effect on the Manufactures from Flax—The Great Factories of Dundee—The Processes of Manufacturing Flax and Jute. Early Days of the British Cotton Trade—The Invention of Spinning and Weaving Machinery, and its effect in extending the Manufacturing Industries of the country—Introduction of the Cotton Trade into Scotland—Notes on the First Factories—The Manufacture of Muslin Trade-Unions, Strikes, and Riots—Progress of the Cotton Manufactures in Scotland—Effects of the American War on the Trade—The Cotton Famine—Description of a Glasgow Cotton Mill. Antiquity of the Art of Dyeing and Painting Cloth—Its Introduction into Europe-Progress of the Art in Britain—Various styles of Calico-Printing—Cordale Printfield and Dalquhurn Dyeworks—Description of the Processes of Calico-Printing and Turkey-Red Dyeing. Antiquity of the Art of Embroidering—Its adoption as a Fashionable Recreation in this country—Made a Branch of Manufacture in Glasgow —Extended to Ireland—Improvements in Printing Designs—How the Trade is Conducted—Embroidering by Machinery. Net-Making by Hand—Story of the Net-Loom and its Inventor—the Musselburgh Net-Factory—How Nets are made by Machinery—Extension of the Trade, and decline of Hand-netting. THOUGH "the Lion of the North and the Bulwark of the Protestant faith had a way of winning battles, taking towns, &c., which made his service irresistibly delectable to all true-bred cavaliers," the discipline was severe, the pay small and precarious, and the promotion slow. It was not often that an inferior officer dropped into such a good thing as Rittmaster Dalgetty when he commanded the whole stift of Dunklespiel. The Imperial service offered greater attractions to cavaliers of fortune, especially when they had left their consciences at home. There was Wallenstein, a living proof of what military talent and soaring ambition might attain to, and Tilly and Pappenheim were scarcely less famous. Did they want wealth, as they all did, had not Wallenstein within a few years of. his mark bought landed estates to the value of 8,000,000 florins. Yet he had long been maintaining the pomp of a Court and had given away as freely as he gathered. The secret was that soldiers of all ranks lived on contributions levied on the country. Gustavus, with only the scanty Swedish treasury to draw upon, from policy was bound to conciliate the states he overran and to respect the privileges and purses of the wealthy free cities. The Imperialists and the soldiers of the Catholic League cast all such scruples to the wind. Like Napoleon, they made the war support itself, but then it was Germans who preyed upon Germans. When Wallenstein, recalled into the field, sent his summons around for a second army, as when Bourbon raised his standard after Pavia, adventurers flocked to him from all quarters. As Mitchell remarks, they knew the terrible severity of his punishments, but they also knew how magnificent were his rewards. In his own camp the discipline was strict, and any breach of it was summarily punished, but that was due rather to pride than principle. Personally he set the worst possible example. Nothing can be more damning, or more illustrative of the misery of the provinces he had ravaged, than the charges brought against him by the Bavarian Elector and the Electoral College of Ratisbon. They were subscribed alike by Catholic and Protestant. They told how the Duke of Friedland in Pomerania had exhausted the revenues of the Duchy in keeping open house; they told of plundering and fire-raising; of men beaten, tortured, and murdered ; of women violated; and they wound up: "Turks and heathens have never behaved as the Imperial troops have done, nor could the devils have behaved worse." Wallenstein had drained Pomerania to keep a sumptuous table when the Pomeranians were starving, and his officers in their degree imitated or surpassed his example when charged with local responsibility and released from restraint. The ordinary adventurer pillaged and squandered from hand to mouth; the more prudent or avaricious turned the screw that they might save against the day of their discharge; and between the two the citizens were ruthlessly fleeced and the helpless peasantry burned out and beggared. But there were men of birth, breeding, and talent, with broader views and definite ambitions. Deliberately careless of their lives and free of their money, they took Wallenstein or Pappenhcim for their models, and hoped to rise like them. Soldiers first, they could be courtiers on occasion, and at Vienna or Munich some happy chance might give them rapid promotion and the pay of the colonel of a regiment. Once well on the ladder they were fairly safe, unless tripped up by some court intrigue or the caprice of a court beauty. The soldier of fortune when he had seen something of the wars was seldom more scrupulous than Rittmaster Dalgetty over his war cry. When he left his native islands he was generally influenced by religion or home politics, and he enlisted on the side whither friends had gone before him. The Catholic Irish had no hesitation; to a man they followed the standards of the Church and the Empire. The Scottish Presbyterians from the far North, like Munro, cast in their lot with Swedish Lutherans and German Calvinists, and at least so long as Gustavus lived they seldom changed their colours. But though in Aberdeenshire there were Forbeses, Frasers, and many others who were staunch to the blue of the Covenant, in the Gordon country and the Garioch the most of the gentry were High Church, High Tory—the epithet had not been invented then—and often Catholic. In the heart of the Garioch, "at the back o' Benachie," as the old song has it, stands one of the square, bartizaned towers scattered broadcast over Aberdeenshire, memorials of the days when every man's hand was against his nearest neighbours. The Leslies of Balquhain, who claimed to be heads of the name, had always been a fighting family. Poor as they were proud, it was only natural that a younger son, with little but his sword for an inheritance, should seek honour and fortune abroad. The Leslies were bred in prelatic surroundings, and it is singular that Walter, associated with a Gordon in the death of Wallenstein, should, like Gordon, have been bred a Calvinist. Judging by the subsequent careers of both, it is probable that religious tenets sat lightly upon them. None could have foreseen that the penniless youth who left the Garioch to trail a halberd in the ranks would have played the leading part in the death of the great captain, gone with the collar of the Golden Fleece as imperial ambassador to the Sultan, married the well-dowered daughter of a princely house, and died a Count of the Holy Roman Empire. Of all the foreign soldiers he had the most exceptional luck. This was a book that we were adding to the site some time ago but was never completed. We've now found a pdf file of the book and so we've now added this to the site so that any of you that were reading it can complete the book. Naturalists of every class know too well how Hugh Miller died - the victim of an overworked brain and how that bright and vigorous spirit was abruptly quenched for ever. During the month of May (1857) Mrs. Miller came to Malvern, after recovering from the first shock of bereavement, in search of health and repose, and evidently hoping to do justice, on her recovery, to the literary remains of her husband. Unhappily the excitement and anxiety naturally attaching to a revision of her husband’s works proved over much for one suffering under such recent trial, and from an affection of the brain and spine which ensued; and, in consequence, Mrs. Miller has been forbidden, for the present, to engage in any work of mental labour. Under these circumstances, and at Mrs. Miller’s request, I have undertaken the editing of "The Cruise of the Betsey, or a Summer Ramble among the Fossiliferous Deposits of the Hebrides," as well as "The Rambles of a Geologist," hitherto unpublished save as a series of articles in the "Witness" newspaper. The style and arguments of Hugh Miller are so peculiarly his own, that I have not presumed to alter the text, and have merely corrected some statements incidental to the condition of geological knowledge at the time the work was penned. The "Cruise of the Betsey" was written for that well-known paper, the "Witness," during the period when a disputation productive of much bitter feeling waged between Free and Established Churches of Scotland; but as the Disruption and its history possesses little interest to a large class of the readers of this work, who will rejoice to follow their favourite author among the isles and rocks of the "bonnie land," I have expunged some passages, which I am assured the author would have omitted had he lived to reprint this interesting narrative of his geological rambles. Hugh Miller battled nobly for his faith while living. The sword is in the scabbard: let it rest! AFTER the withdrawal of the Roman legions from Britain in the fifth century, to quote the graphic words of the late Dr. W. F. Skene, [Celtic Scotland] the British Isles seemed, as it were, to into the recesses of that western ocean they had emerged in the reign of the Emperor Claudius. In the following century, Procopius, writing from Constantinople a scanty description of the lost Roman provinces of Britain, said that he believed that part of the island nearest Gaul was still inhabited and fertile, but that it was divided from the rest of the island by a wall, beyond which was a region infested by wild beasts, with an atmosphere fatal to human life, wherefore it was tenanted only by the spirits of the departed. Now the wall referred to was probably that rampart erected by Lollius Urbicus for the Emperor Antoninus Pius about A.D. 140. It stretched between the Firths of Forth and Clyde, and connected the detached forts built by Julius Agricola seventy years before; but the reference may have been to the earlier wall, that great fortification drawn by the Emperor Hadrian from the Tyne to the Solway, roughly parallel with the line dividing England from Scotland at the present day. Whichever barrier Procopius had in mind, whether it was the whole of modern Scotland, or only the Highlands, that he included in his un-complimentary estimate of the climate, the fifteen centuries which have run their course or nearly so, since he laid down his pen have not served wholly to efface the unfavourable estimate of Scottish seasons entertained by many travelled, and all untravelled, southerners. "As in the Northerne parts of England," wrote Fynes Moryson in the seventeenth century, "they have small pleasantnes, goodnesse, or abundance of Fruites and Flowers, so in Scotland they must have lease, or none at all." As you may know many Scots married into Native Indian Tribes. This article gives you information on how you can confirm if you have an Native Indian DNA. Got two enquires in that you might be able to help with. The first is about seeking information on a Scottish monument, possibly the "Riddell Monument". The second is helping to identify a 400 year old spoon which was sent from Scotland to the USA around 1800.